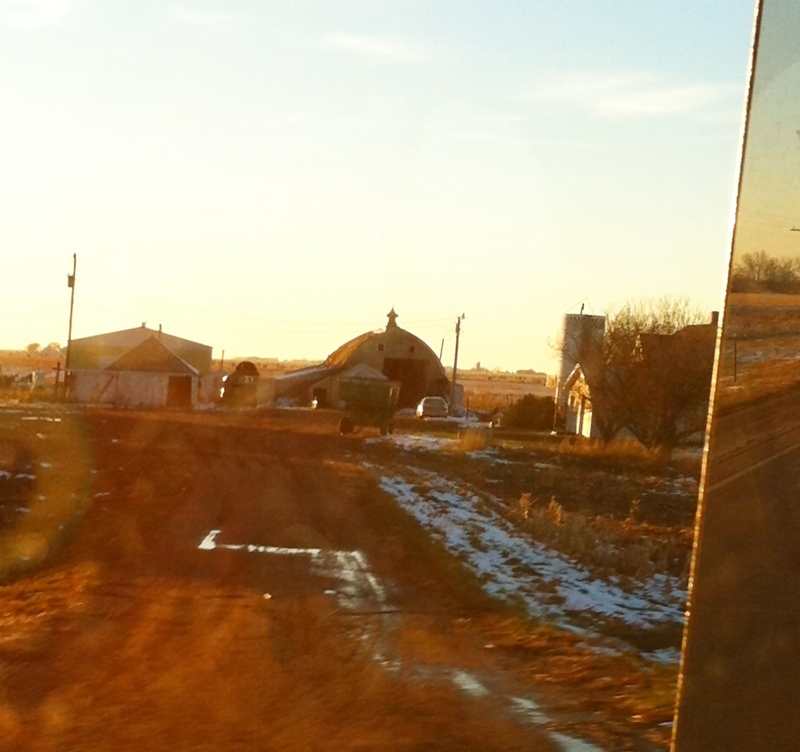 Rumors of a serial barn killer abound in the northern mid west. The quiet little communities of northwestern Nebraska, southwestern South Dakota, and southwestern Minnesota are not the place one would think of as a hot spot for rampant carnage. 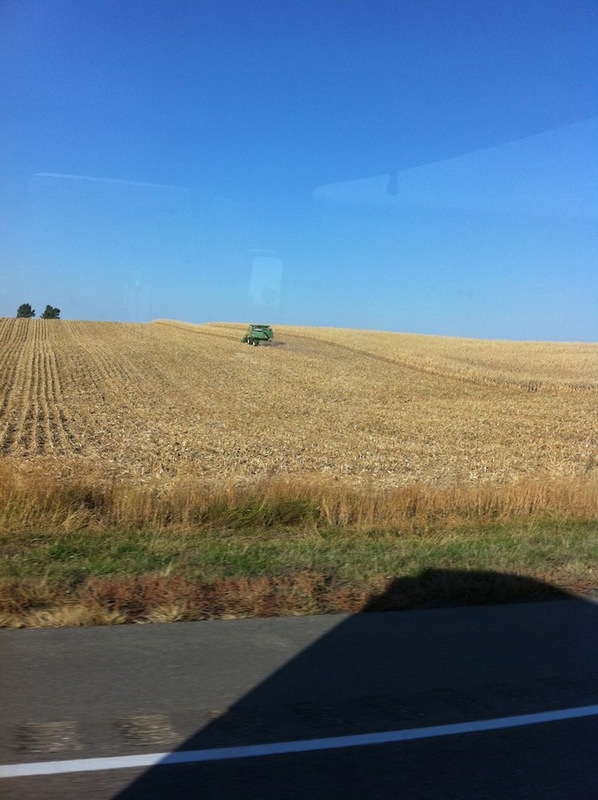 The harvested fields lay wide open along the highways exposing acres of open ground. In the barn community there are rumors. Rumors of a serial barn killer. The evidence is unsettling. 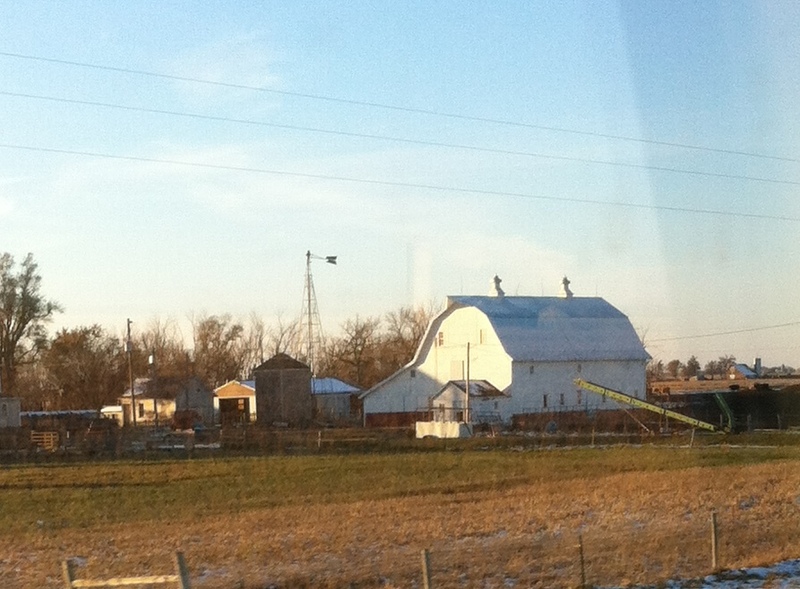 These two in Nebraska have the barns in an uproar. 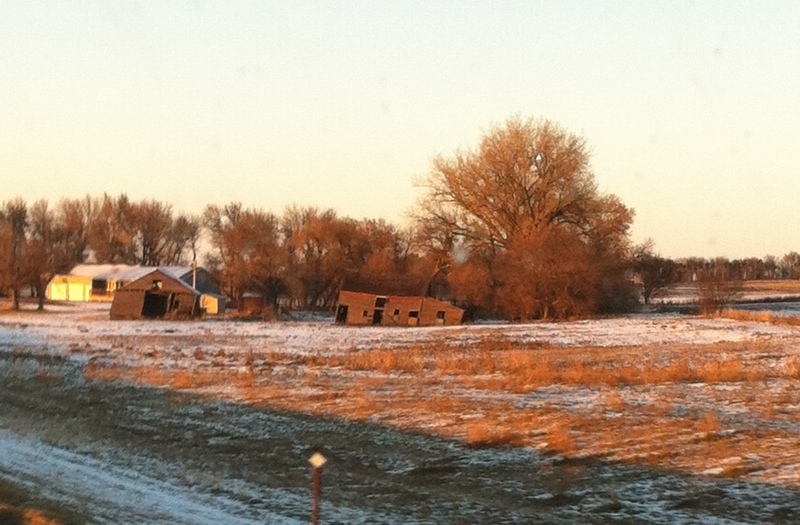 This barn in Minnesota has survived an attack but is in critical condition. Investigators are doing their best to sift through the witness accounts. An attempt is being made to figure out what is fact and what is fiction in this ongoing investigation. Interviews with these two witnesses seem to be part of the problem. Each has a different story to tell about what they know. Another group of investigators have tried to interview these barns and have had very little success. It seems, according to a source, the atmosphere here is one of gathering together and not saying much. A couple of investigators have had to deal with a small group of paranoid barns. 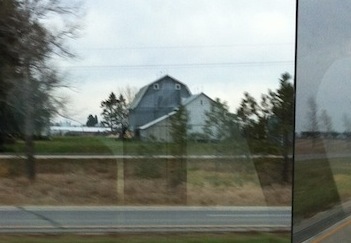 These barns have voiced their concern of an evil monster stalking them all. 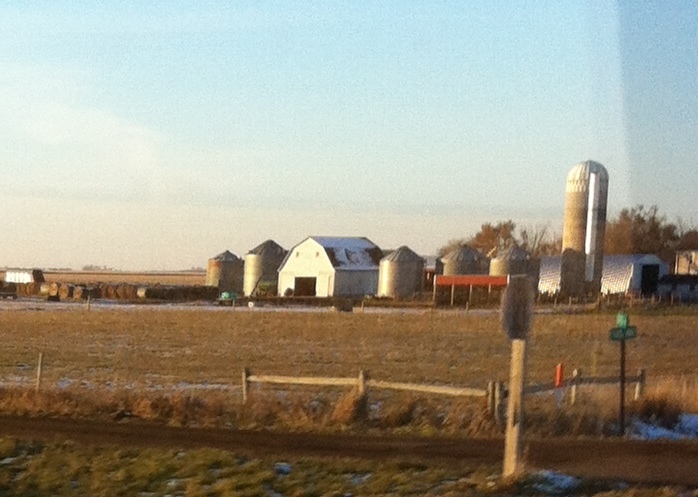 One of the barns, the one in the forefront, has even stated that this is the work of the devil and has even seen it. Investigators are not discounting the rumor of the devil in these accounts. In fact, one investigator has actually seen it. Getting information from the barn community is a hit and miss proposition for the investigators. 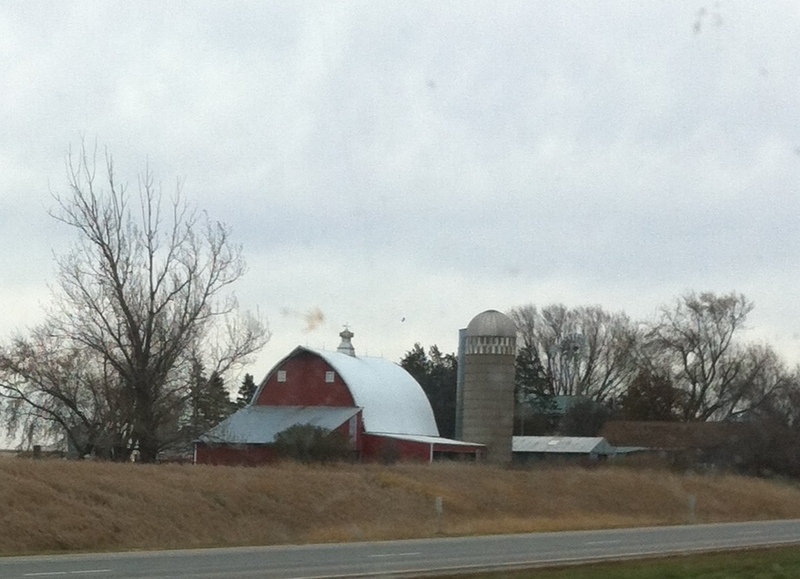 This barn is not saying anything. In fact, this barn didn’t even want to talk to investigators. 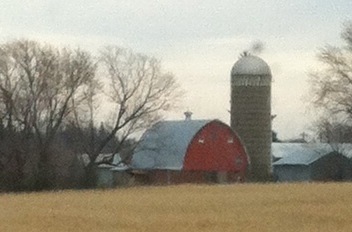 This barn tried to hid their face from the cameras during an interview and only spoke in whispers to the investigators. 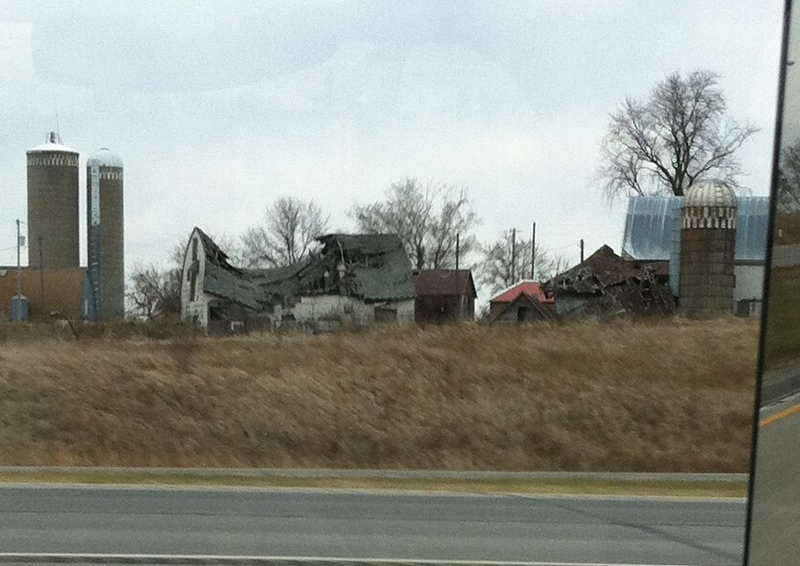 The deaths of these two barns have been under investigation for some time. It is presumed these two had been among the first of the serial barn killers victims. Investigators have had their hands full in dealing with barns that are so frightened by the events that all the barns do is scream and cry. While some barns have been helpful there has been one that has been quite rude. Demanding the investigators to get off their property. This barn would not come out and talk with investigators. Preferring to stay behind a screen and out of view of the photographers. This barn, when interviewed, said that it had seen the whole thing and was living in terror. Protection teams have been posted to keep this barn safe. 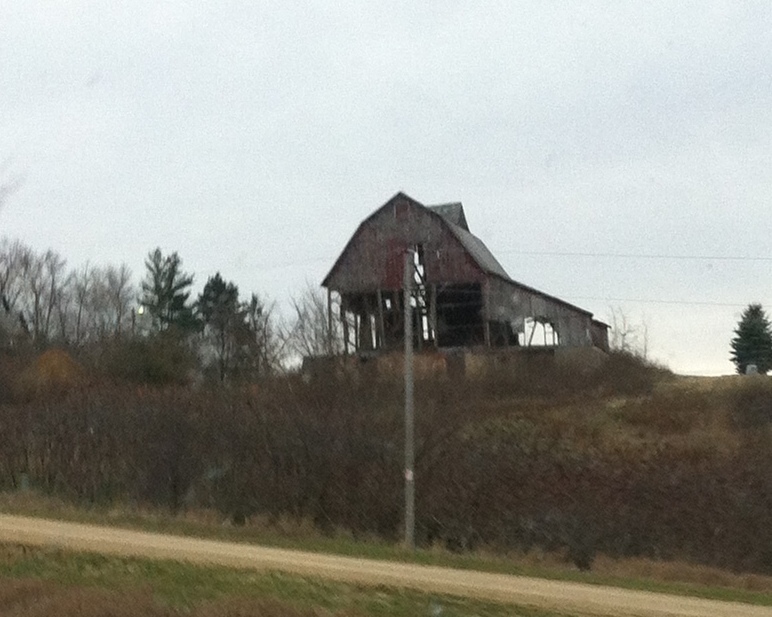 This barn says that it has photographic proof of the barn killer. This is the proof the barn shared with investigators. 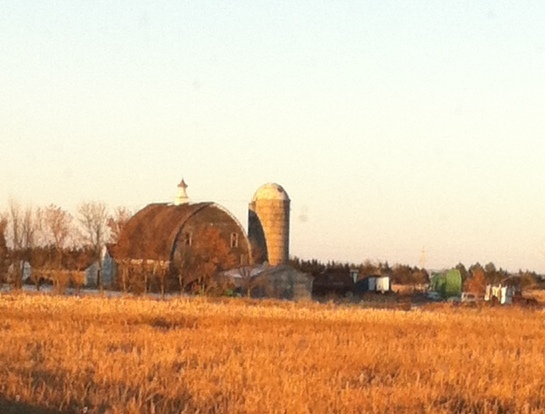 Okay folks, this is the last of my barn photos. If there are any people that read my blog and are the owner(s) of any of these barns, not highly likely though, I hope I have not offended you. If, in the unlikely event, you do spot your barn and it is not located where I have indicated on the photo remarks please feel free to leave a comment with the proper location. 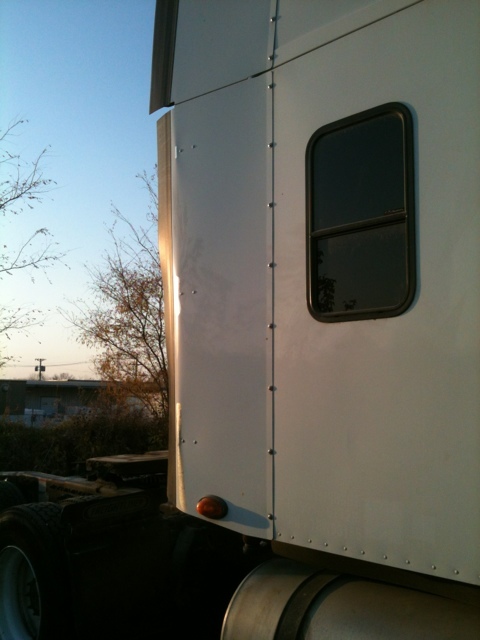 Cab extenders, or air fairings, are located at the rear of the truck cab on each side. The fairings are for fuel economy. 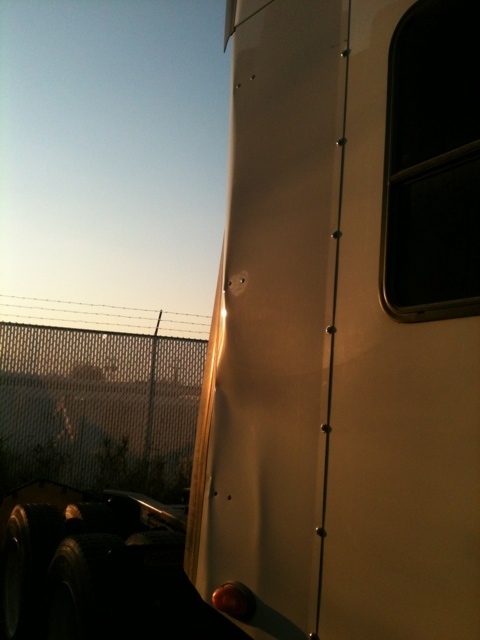 Allowing the truck to “slice” through the air cleanly with no place for “drag”. 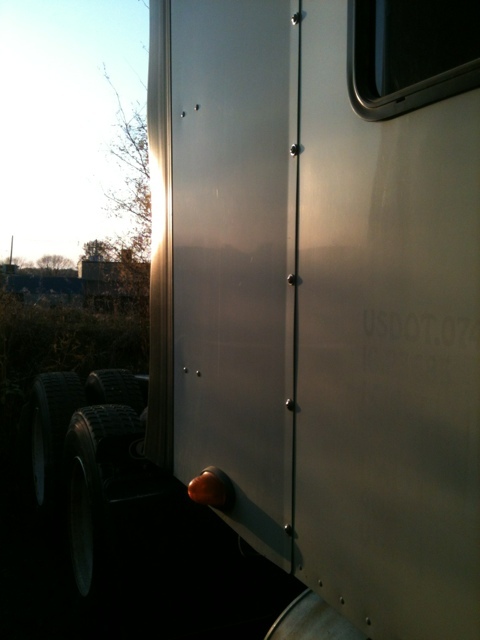 The fairings direct the air flow in a stream to the rear of the trailer when one is attached. The fairings extend from the roof to the bottom of the cab in a two piece unit. 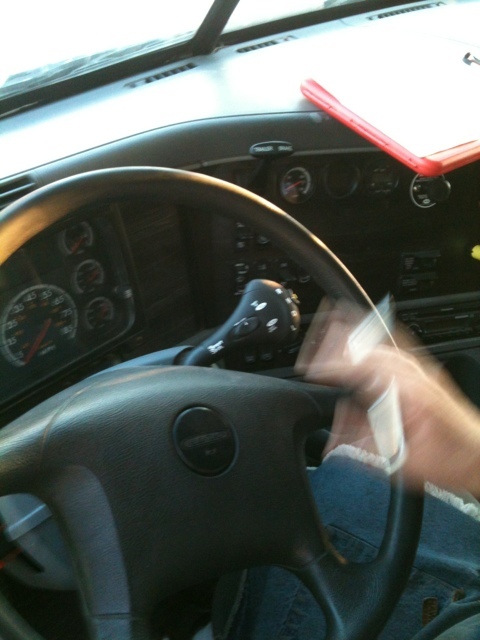 Just to refresh your memory on automatic transmission levers in big trucks. these trucks have an “Auto Shift” transmission that is started in gear using the clutch. Here is the tell tale sign. Someone got their crank the wheel on and got with the program. The cost to replace the bent air fairings start at $600 each and goes up depending on any damage transferred to the rear of the cab. 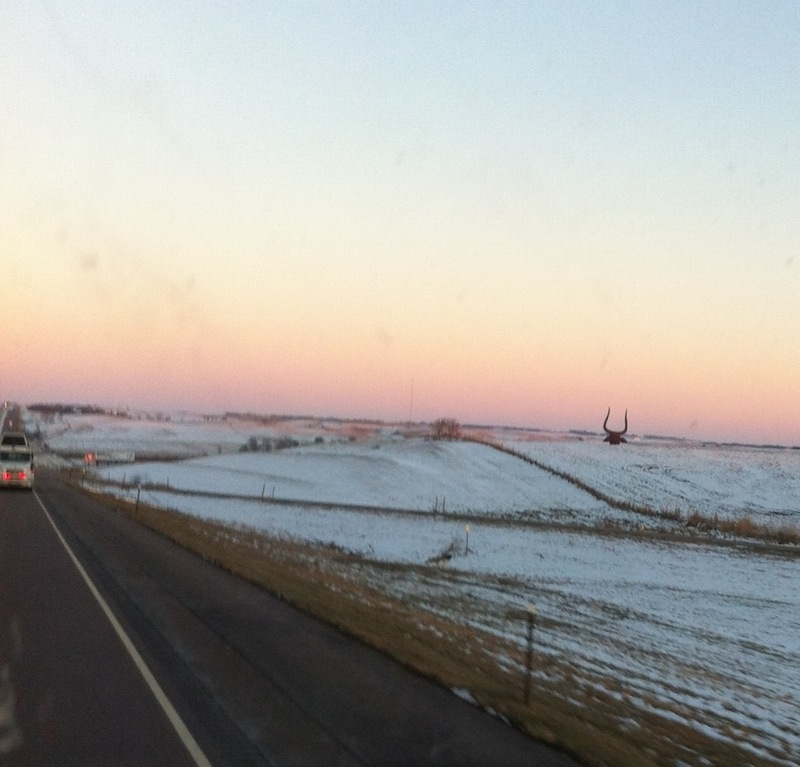 We are in Cedar Rapids, Iowa tonight. We arrived just at closing time so we will hook up tomorrow morning. 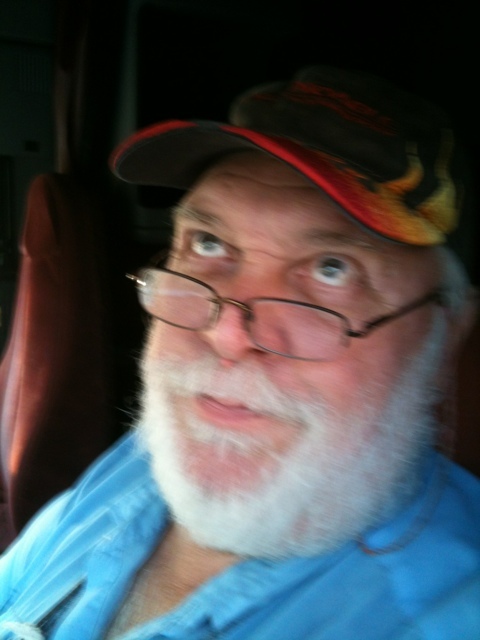 Once on the road we will be going right through Danville, Illinois. Shelly lives near Danville. I have talked with her and we are trying to set a time to meet. I’m looking forward to that. Oh before I totally space out a fantastic experience I have to tell you about a business that topped the chart on “Above and Beyond Service”. Oxboro Eye Clinic in Bloomington, Minnesota. One of the nose pads on my glasses broke off a few days ago. We had to stop at FedEx Kinko’s to make photocopies and right next door is an eyeglass store and clinic. I went in dressed in my road weary attire with a grease spotted fleece jacket. I was warmly greeted by all behind the counter. My glasses were whisked off to the back room to be fixed while I waited at a service table. After placing my day book on a chair I went to a wall displaying a vast assortment of frames. I tried a few on. Did you know the “cat’s eye frames” from the 1950’s are back in style?! My glasses were fixed up with new pads on both sides of the nose piece and they did not charge me. I’m learning how to accept gifts gracefully. I tweeted about the clinic and having a great experience there. Wait, it doesn’t stop there. 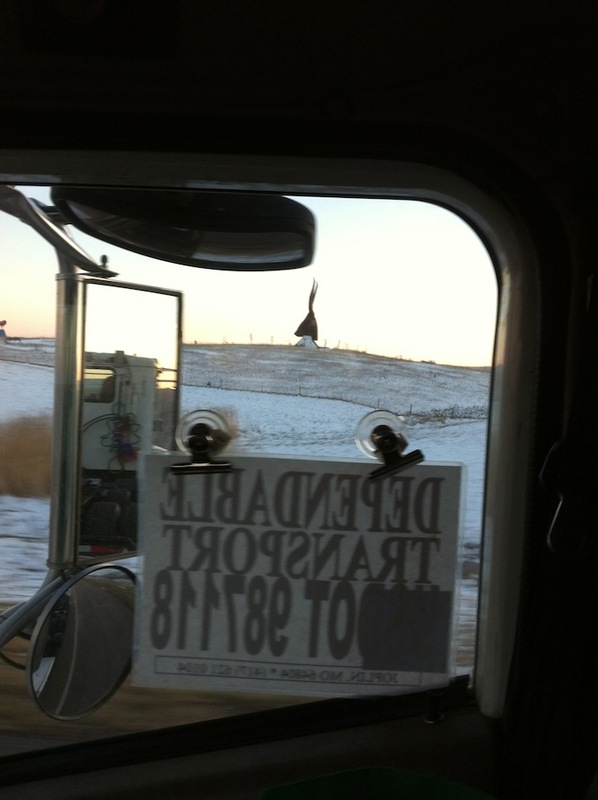 Joe and I were 55 miles from Bloomington when he was called about a day book being left behind. Handing me his headset I talked with the woman *shame faced I don’t remember her name*. This wonderful woman took my day book next door to FedEx and began the process of getting my book to me tomorrow morning. She was given our number, I mean I am the one that left it behind. Blessings happen often and in a myriad of ways :-). The world would have you think people are awful and out to get you. The majority of people are considerate and kind. Joe and I are continually blessed by people all over. Today’s event proves this out. We could have been making a trip back 55 miles for my mistake and had several people in very bad moods. Joe and I would be two of them. 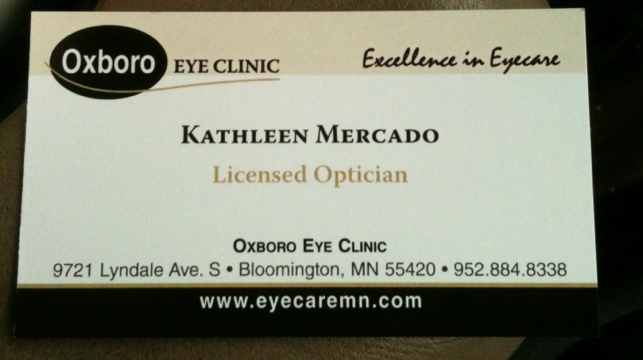 So special Kudos go out to Oxboro Eye Clinic in Bloomington, Minnesota.